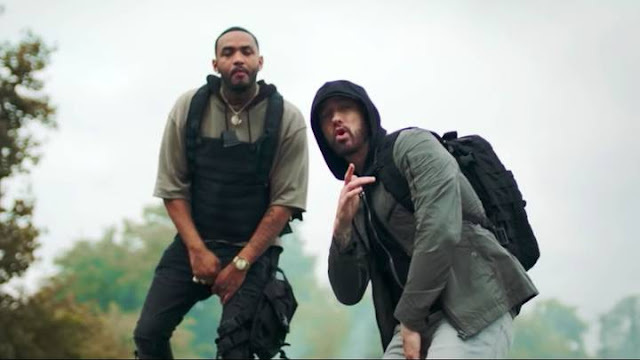 The inspiration behind the vid is pretty straightforward: Eminem inspired an entire generation of MCs, and he believes they shamelessly and deliberately copy his every move. The video takes that concept literally, as hordes of hooded, red-eyed men imitate him and Lucas as they rap on top of wrecked cars in a run-down town. Em and Lucas proceed to have some fun with it, making their imitators dab, hump the air, and hop on one foot while patting their heads. Lightheartedness aside, however, it's clear Em is sending a message to the hip-hop world: They may be watching his every move, but he's watching them, too. Though Kamikaze has sparked countless debates about the return of Slim Shady, the album still sold enough to deliver the ninth No. 1 album of Eminem's career. Maybe this was the revival fans were waiting for.